It was under this shadow that J Rocc first assembled the Beat Junkies in 1992, pulling together a multicultural bunch of 20s-ish DJs who were already in different crews but shared an affinity. According to J Rocc, ”These were the guys I was deejaying with at the time. Since we were all deejaying, we were all hanging out, I said, ‘Yo, let’s go start a crew.‘“ The original group included J Rocc, Rhettmatic, Melo-D, Curse, Icey Ice, What? !, Havic and Symphony. 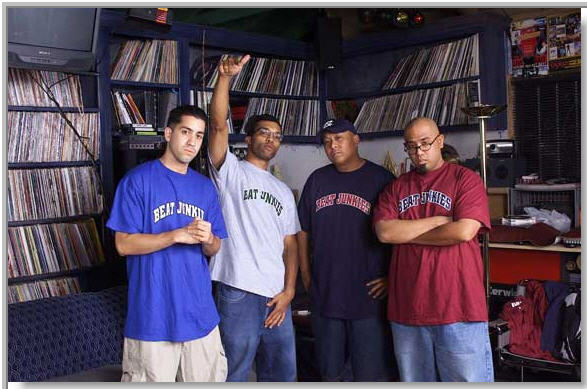 A couple of years later, Rhettmatic invited Bay Area ”honorary“ members D-Styles and Shortkut to join, and the Junkies’ lineup was completed in 1995 with the addition of Oxnard‘s Babu and Bakersfield’s Mr. Choc. The Junkies’ greatest accomplishment has perhaps been simply to stay together. Hip-hop‘s competitive — if not straight-up divisive — atmosphere has decimated crew after crew of MCs, DJs and breakers over the years. And though the Junkies have seen a couple of people come and go, for the most part the core group has stayed intact for 10 years, despite all the projects each is involved in. Their secret to group harmony isn’t complicated: The Junkies began as friends and remain bonded through that camaraderie. ”These are my friends, who I‘ve gotten to know through thick and thin,“ says Rhettmatic. ”I’ve gone through a lot with these guys, and not to sound cheesy, but I would die for them.“ The other members pause at the weight of the statement before breaking into smiles. When asked what he appreciates about Melo-D‘s unique qualities, J Rocc says, ”His strong point is getting beaten by me in Foosball,“ and the table erupts in laughter. As J Rocc gets serious with his praise, it’s obvious that his admiration for his peers is heartfelt, even if coded in snaps and caps. As this circle of friends embarks on its second decade, the immediate goals include building up Beat Junkie Sound, the crew‘s new record label. For a group who’ve basically earned their livelihood by playing records, the Junkies are now getting serious about making them. Any which way, the Junkies aren‘t behaving as if this is the golden time of their careers; it’s more like the first 10 years were just a warm-up.